Emails from the Computer History Museum have confirmed they have a PDP-7 in storage, having originally been at Massachusetts General Hospital, it is one of two delivered to the hospital in 1965-66. The machine in photo (right), we think is probably S#33, CHM have checked their machine in storage but a matching serial number has not been found, so it is now unlikely that we will find out which of S#33 or S#103 the photo actually is. Either way the machine in the picture does not appear to be complete as it is missing its tape drives. 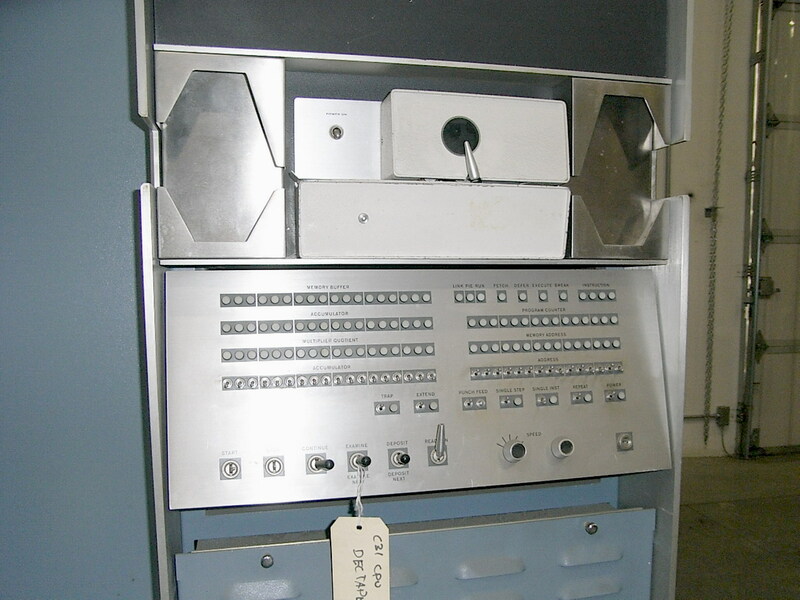 December 2009 - Len Shustek at CHM has forwarded a few more photos of their PDP-7 in storage, unfortunately they don't go any further in ascertaining the identity of the Massachusetts General Hospital machine other than to confirm it came from their Psych. Res. Laboratory. 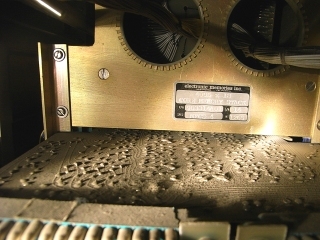 Serial numbers still need to be found, the only evident serial number on the core memory stack photo does not match the service list for either of the two machines. The physical condition of the machine is very good if not somewhat dusty, with the front panel operator controls having suffered from the usual storage damage that PDP-7's seem to get - broken and bent switch levers. S#33 was a PDP-7 and had options - 7, 30D, 75D, 138E, 139D, 149D, 177, 444B, 555A, 649, PDP7. S#103, a PDP-7/A, had options - 138E, 139E, 149B, 177B, 550A, KA71A, KA77A, 2x TU55. 7 000041 0166 999999 ? For descriptions of the above options see the full PDP-7 options list. 120 PDP-7 and PDP-7/A systems were forecast to be built in total, but the 1972 18-bit service list available (6.5Mb pdf download) with only has details of the 99 known PDP-7 and PDP-7/A systems in the list at that time. We do not have any information about the possible remaining 21 systems, who they were delivered to or even if they actually existed. The PDP-7 appeared to have sold well into Government research and University sectors with 11 systems shipped to the UK alone, almost 10% of the forecast production run! Serial numbers are concurrent for both PDP-7's and the PDP-7/A's, so the missing 21 could be of either type; however we are reasonably confident that the 99 systems shipped were the only ones that were ever built. If you know of any information about any of the PDP-7 systems worldwide, options, location of existing systems, spare parts, ancillary bits, software, tapes or manuals, then please contact us. "I was the Digital Equipment on-site field service technician at Mass General Hospital 1967-1969 working out of the Cambridge/Boston office. There were two PDP-7 systems at MGH on contract at that time." "Serial Number 33 - was located in the Warren Research Building. It was used mostly for brain research, involving sleep, eye/brain interaction, and even some monkey brain wave studies. This one I remember as being in Warren Research since it included the 30D display and light pen. The 30D display was actually in a remote ‘Dark Room Lab’, sound isolated and light tight. The subjects of the research would generally be in this space. The machine was used for experiment data collection and data evaluation." "Serial Number 103 - was located in the basement of the now demolished Thayer Building, currently the site of the Cox Cancer Center at MGH. This machine has a very important place in the history of software development. 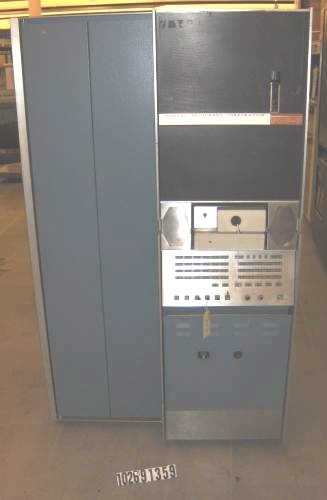 "The spare" PDP-7 as it was known at MGH became the origin of MUMPS - Massachusetts General Hospital Utility Multi-Programming System, later titled Multi-User Multi-Programming System. Neil Papparlardo and Curt Marble under the guidance of Octo Barnett developed and released the initial software on this machine." Further information on PDP-7/A S#103. When I was hired by Digital in 1967 the PDP-7 was the current 18 bit processor being supplied by DEC. The PDP-9 was in development and soon to be released. At that time Field Service techs, my self included attended PDP-4 and PDP-7 training classes, in the 18 bit world. There were 12 or so PDP-7’s under field service contract in the Boston/Cambridge area. Among the others were two at BBN (Bolt, Beranek and Newman) #148 and #150 as front ends to the TELCOMP timeshare systems. Two identical systems at MIT Lincoln Labs these were relocated from Billings Montana for seismic studies, and were very large systems with a custom interface that allowed them to share six Midwestern magtape drives, a card reader, and an Analex 132 column line printer. I hope I have shed light on the systems you have in your domain. Very interesting work you have done and continue to do. Dave.